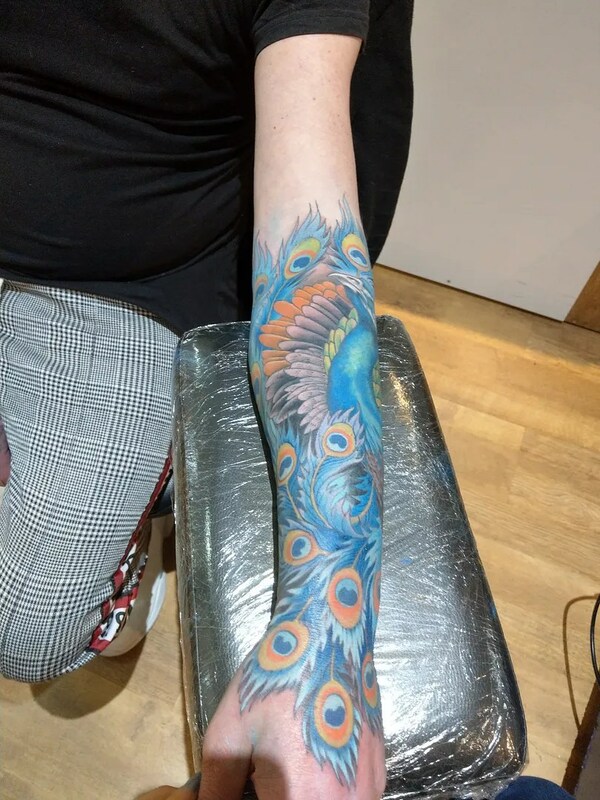 Plenty of pretty colours for you in this blog as usual, it’s what i get asked for most, and I love colour as much as the next person, so it’s perfect! 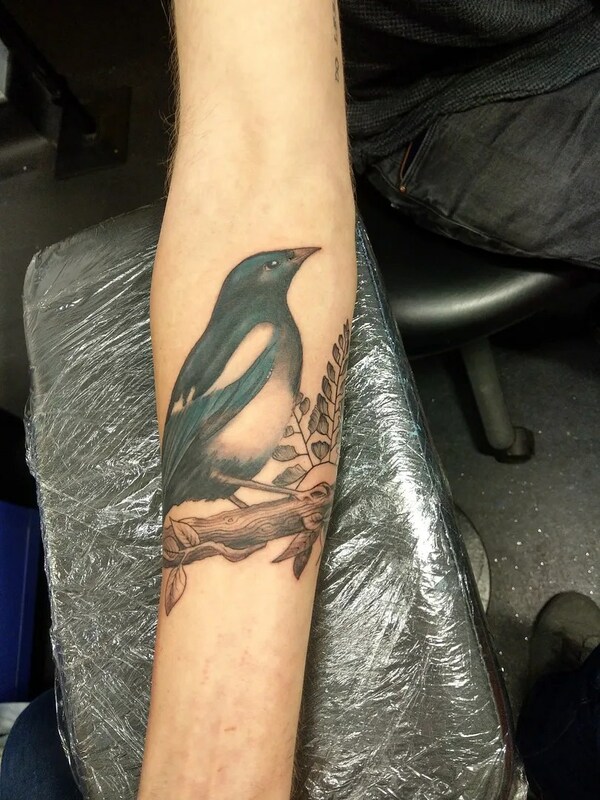 A much more subdued bird is this magpie, part of an on going botanical drawings style sleeve. 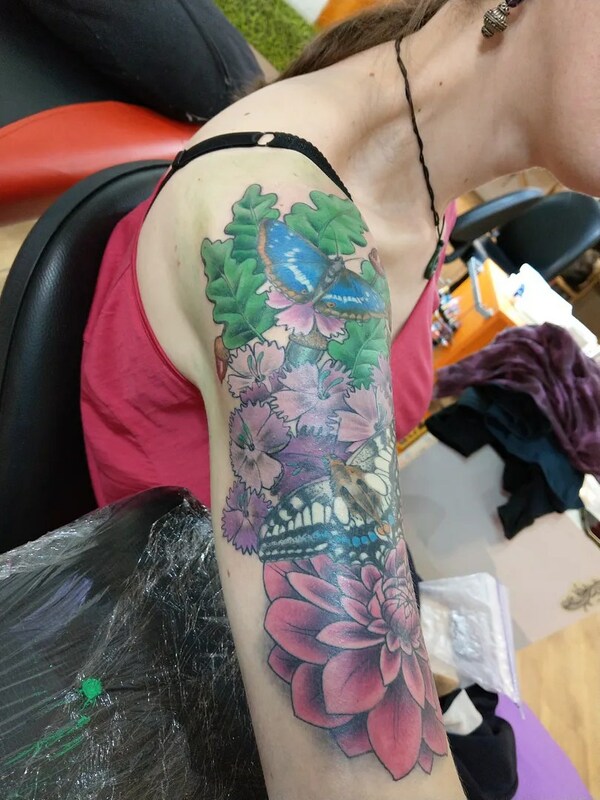 We kept the colours in the Victorian palette, to look like hand tinted plates in a book. 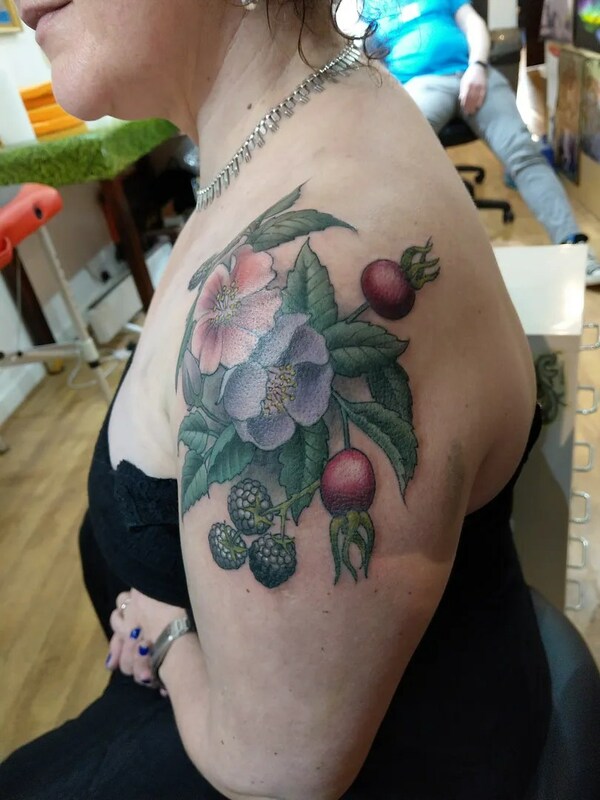 Speaking of a muted colour palette, this cute little cover up is reminiscent of designs from yesteryear, incorporating brambles, rosehips and dog roses. 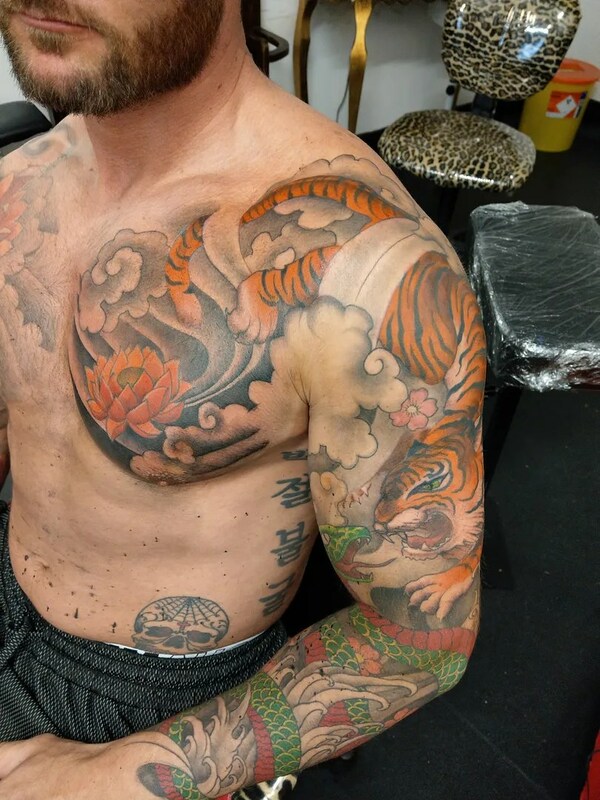 A couple of scar cover ups next. 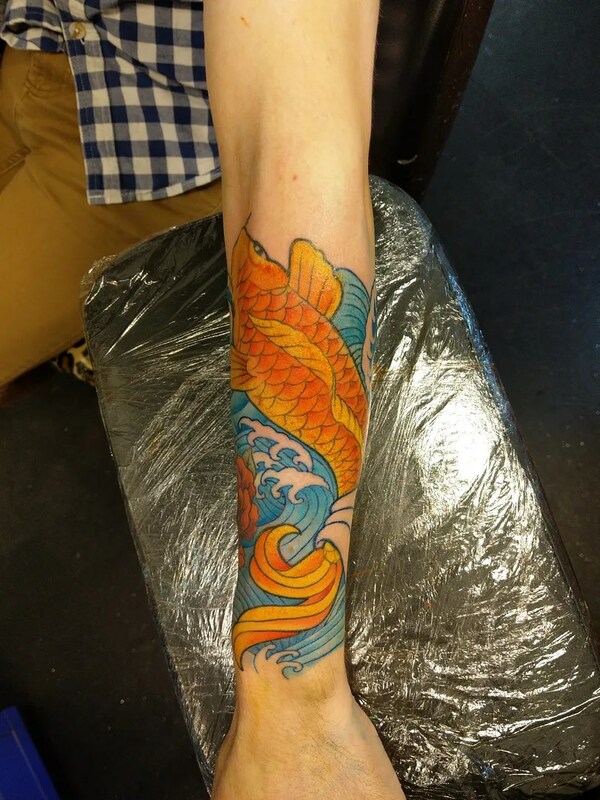 This koi piece in chunky modern colours and shapes is japanese in influence, but more manga style than traditional. 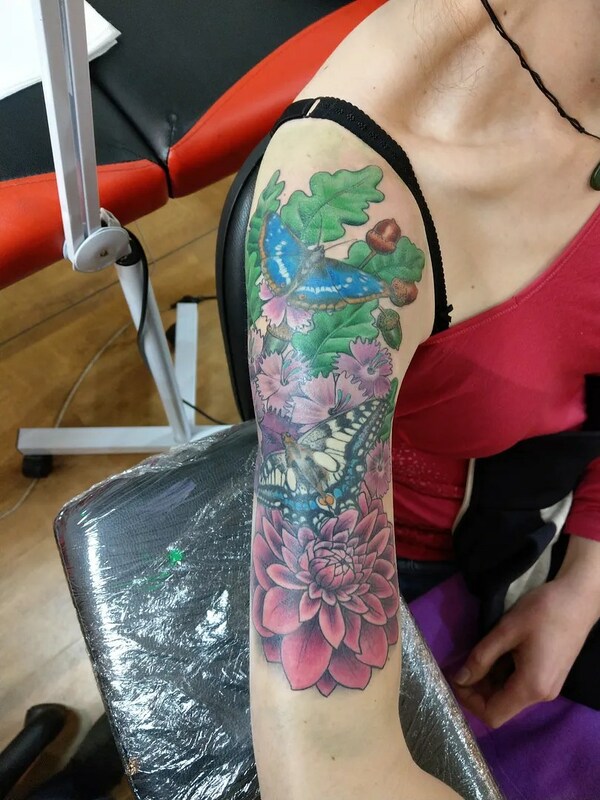 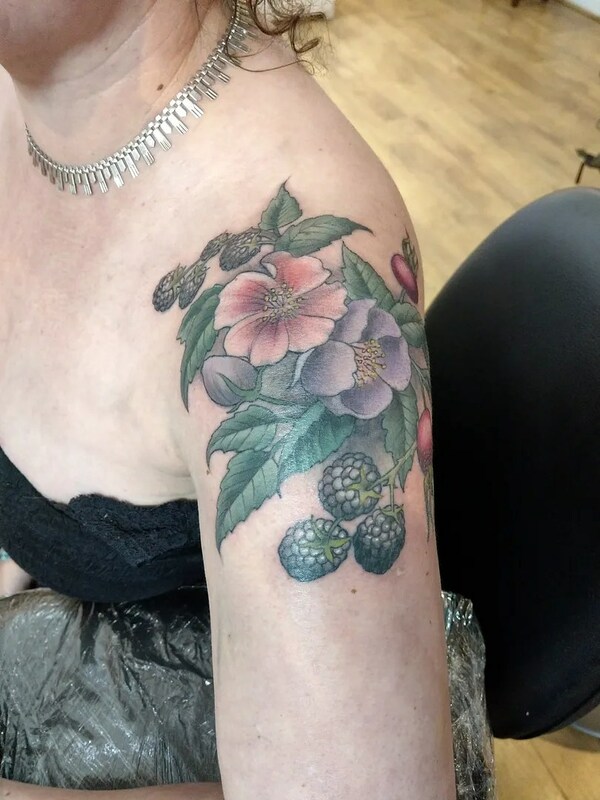 The peony flower is where we hid the worst of the scars, the irregular, organic shapes of the petals allowed us to hide any bumps and lumps in the skin. 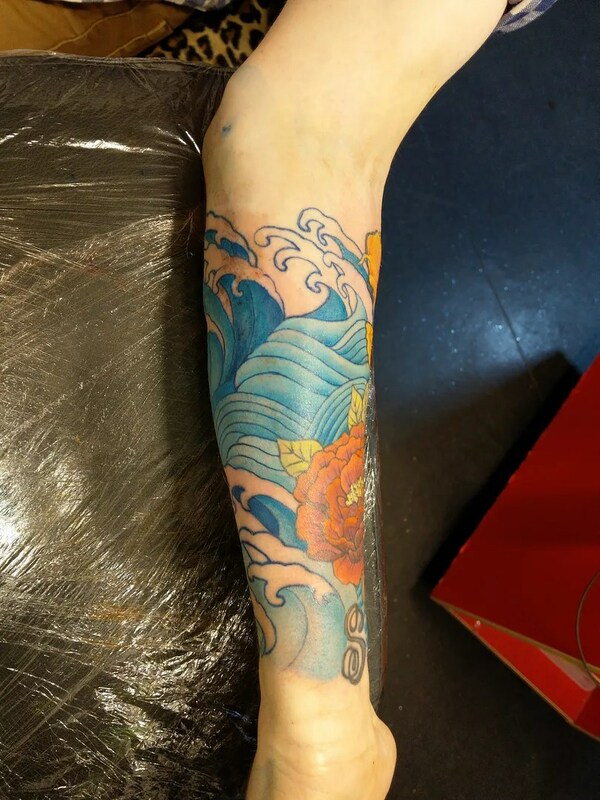 More scar cover ups, and here I’ve got to say I did a piece over the scars that I would normally advise against. 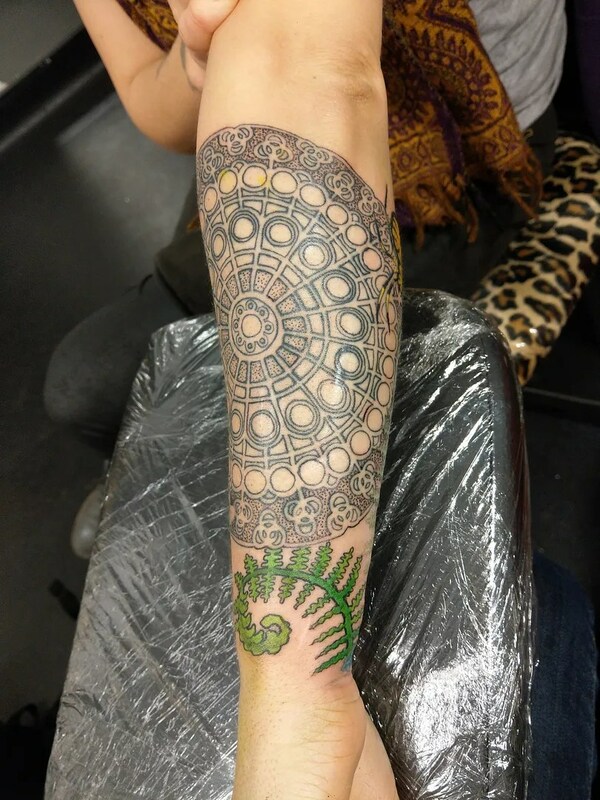 The intricate shapes of the mandala really don’t do a good job hiding any irregularities, but I’d warned the customer and she was cool with it. 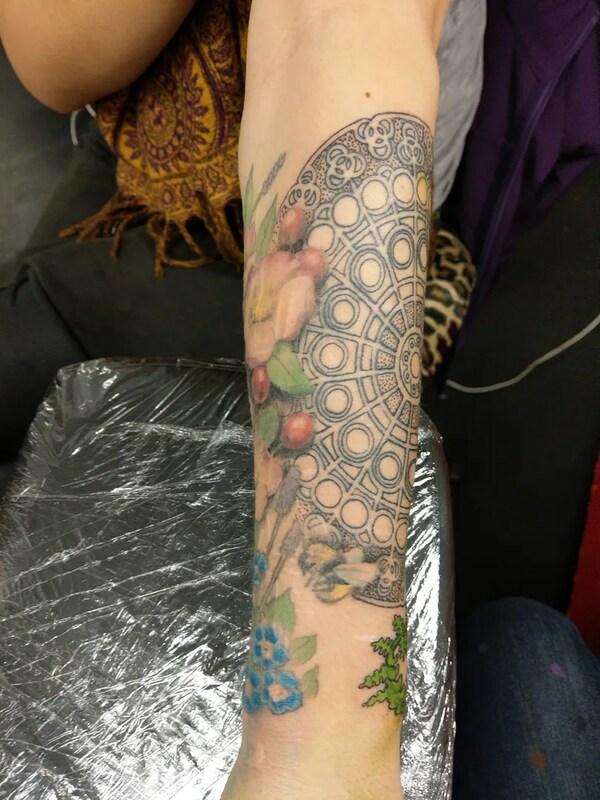 You can see where the lines blew out a bit on the scar tissue, but on the whole we pretty much got away with it- it helps that there are soft, organic flower shapes right next to it, they help draw the eye away from any inconsistencies. 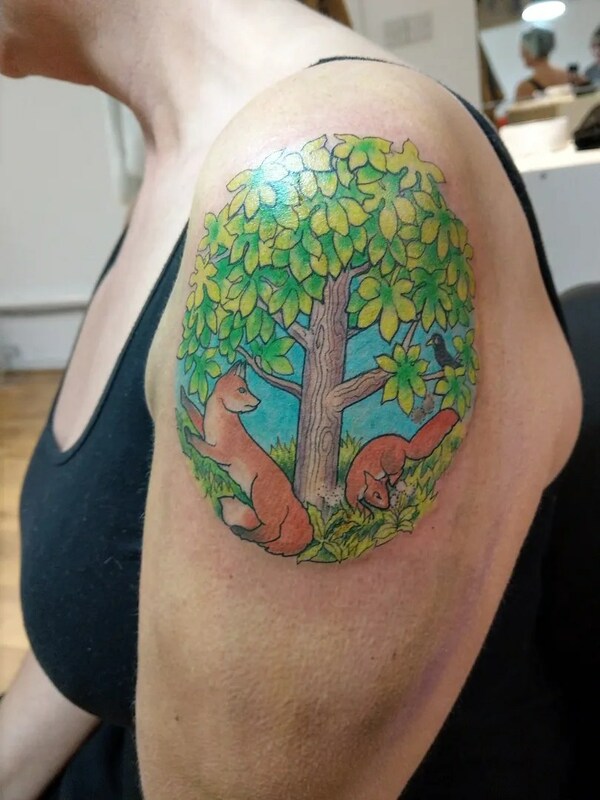 And a cute little story capsule, this is an illustration for the poem ‘Tamsons Bairns’, with a fox and a red squirrel. 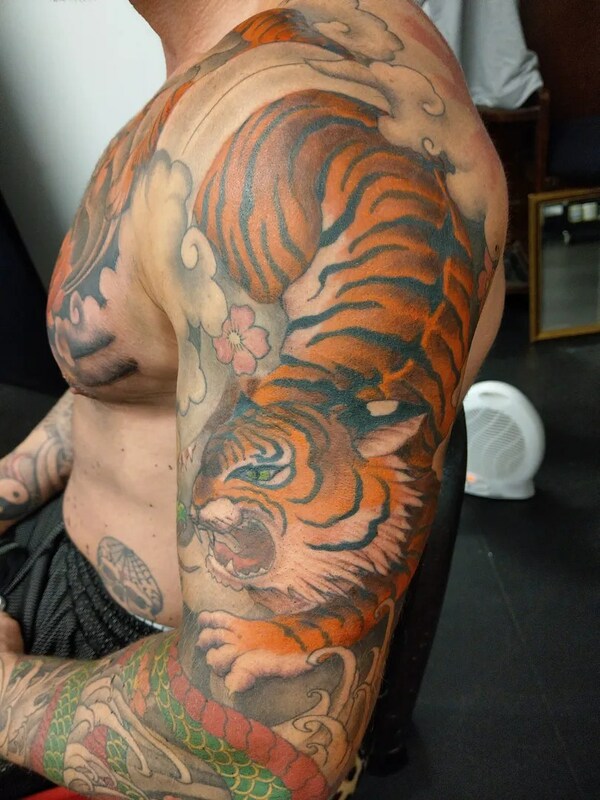 And here is a big and bonkers story capsule, if you can call it a capsule- it goes over both of Derek’s upper arms and onto the chest. 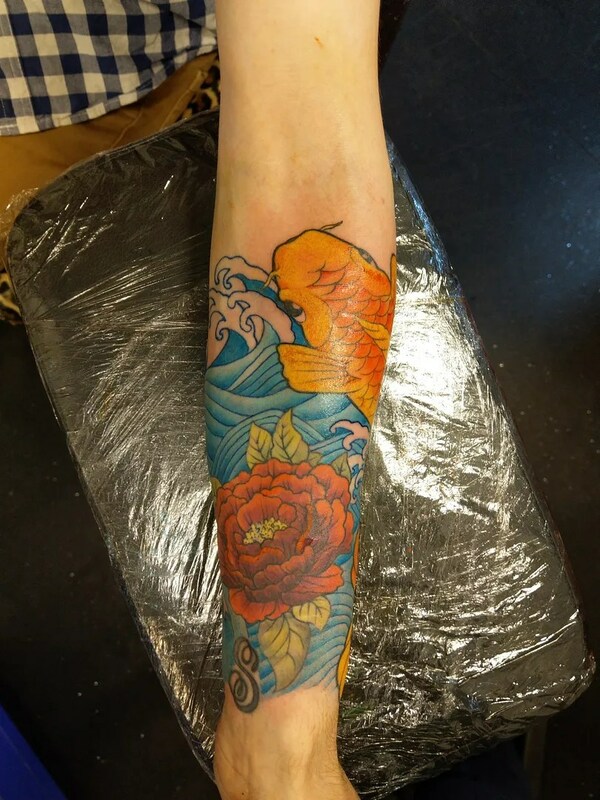 The work in progress design weaves around the four elements, water and fire on one side, and earth and air on this side. 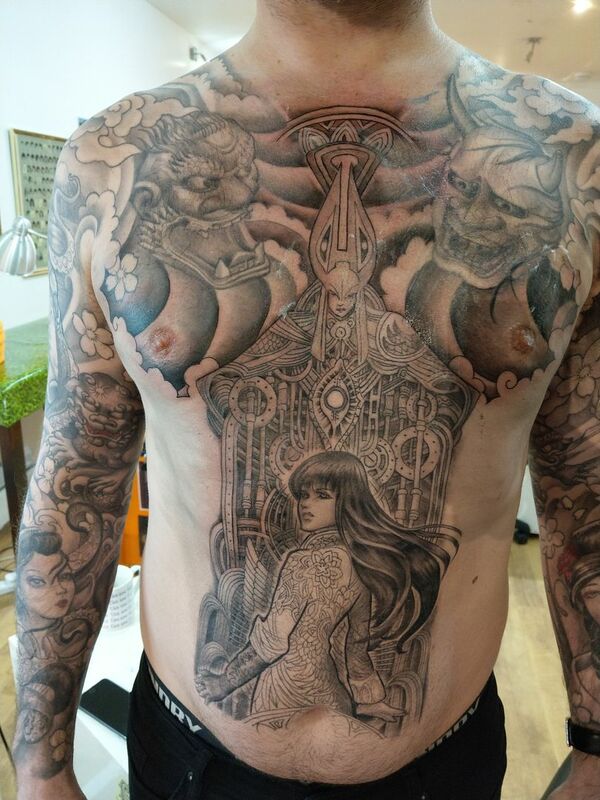 The mad vortex represents air, with butterflies coming out of it and flying onto the chest. 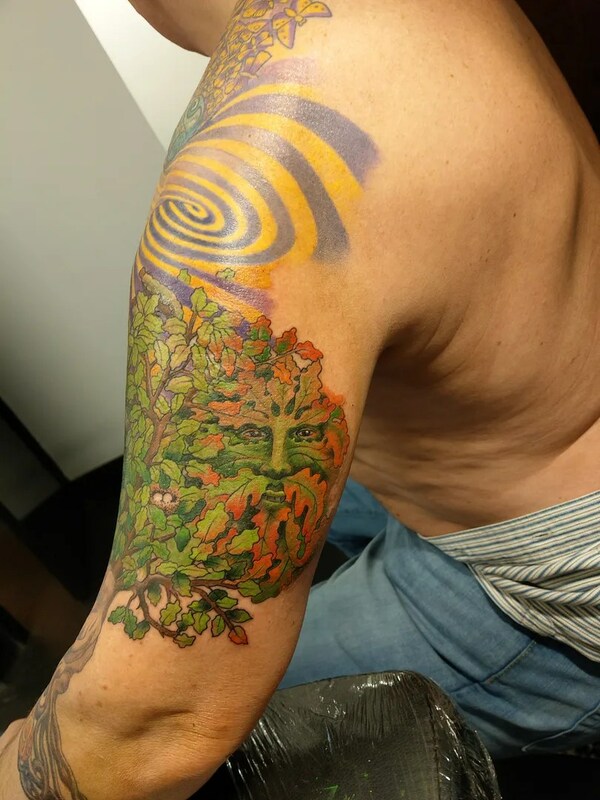 The earthy side starts with celtic roots, going into the tree of life, which incorporates the green man (and woman, next sesh) and little cute caterpillars climbing up into the vortex, to be reborn as the butterflies. 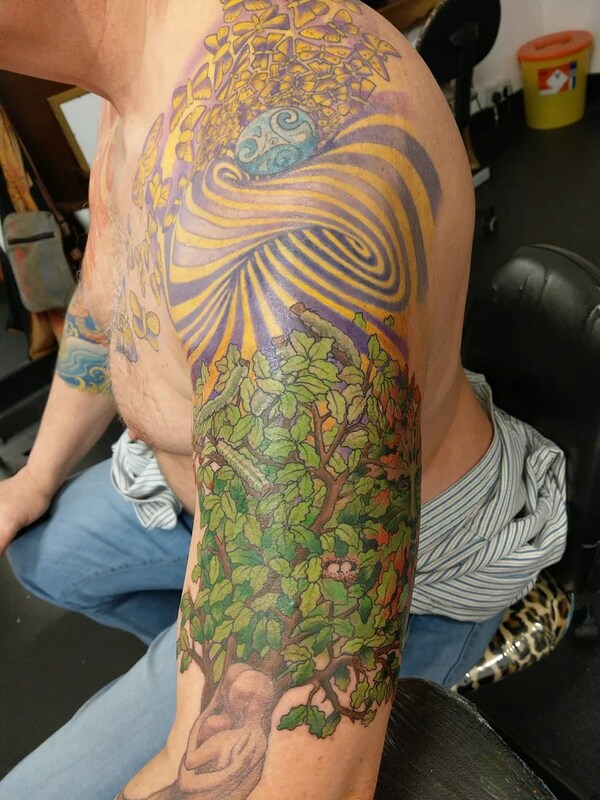 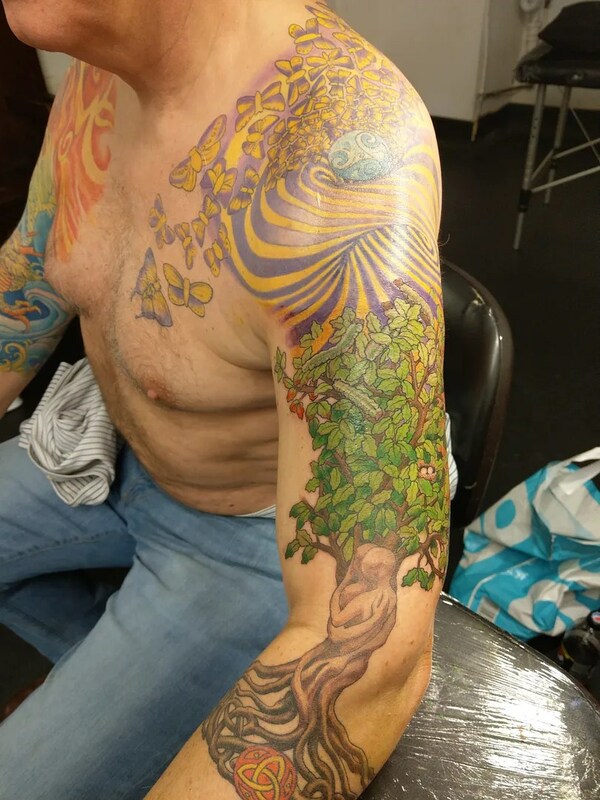 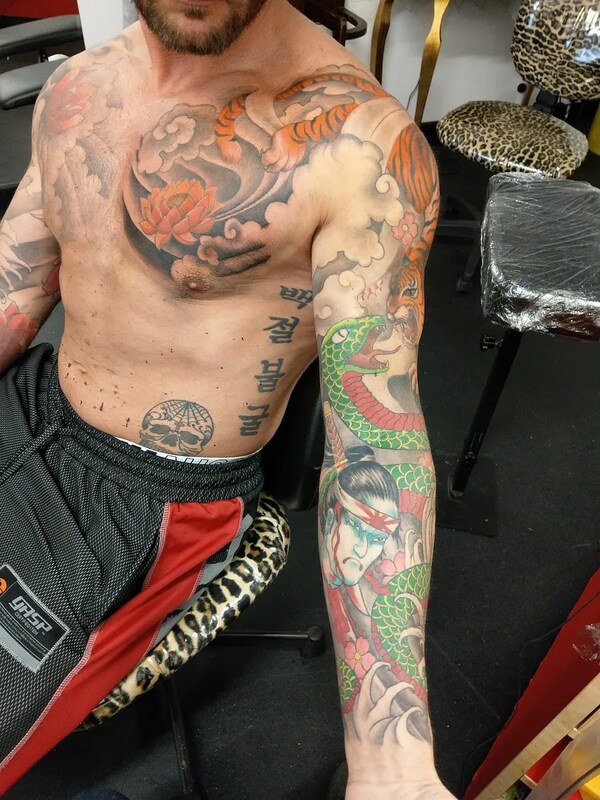 This all came out of Derek’s brain, I just helped him put it all together on his arms- it’s been a fabulously organic process, just the way I like it! 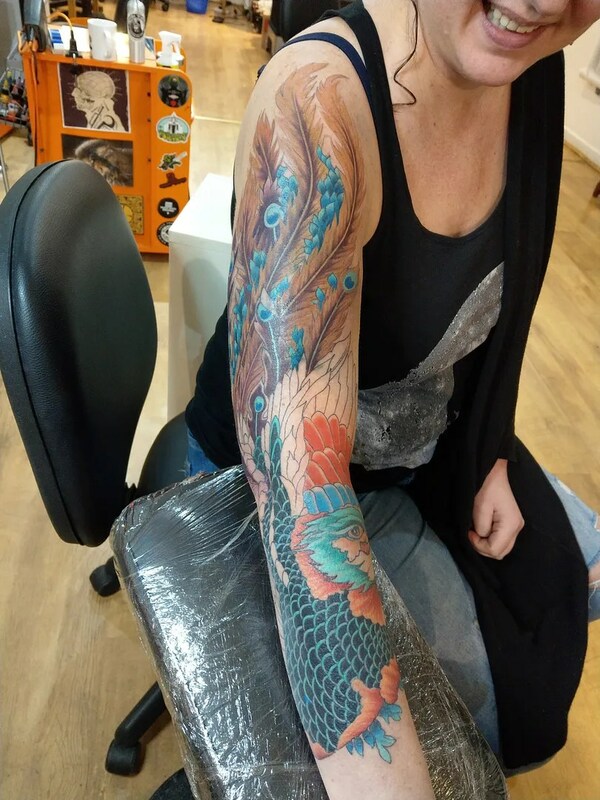 Some planning is important, of course, but my favourite way of working is for the ideas to grow with the piece and for it to be a collaboration with the customer. 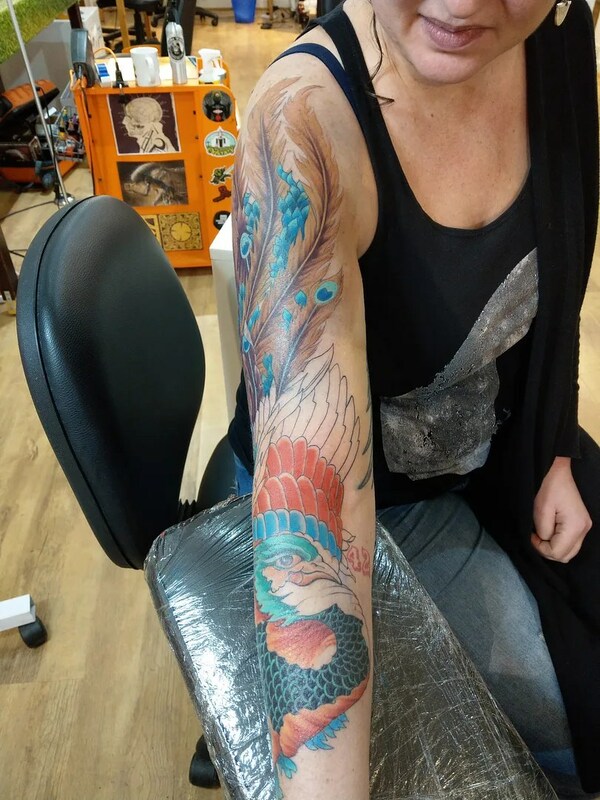 This phoenix work in progress is based on a painting by Hokusai, (Hokusai the one with the famous wave painting), muted colours and repetitive shapes give this a classic japanese look. 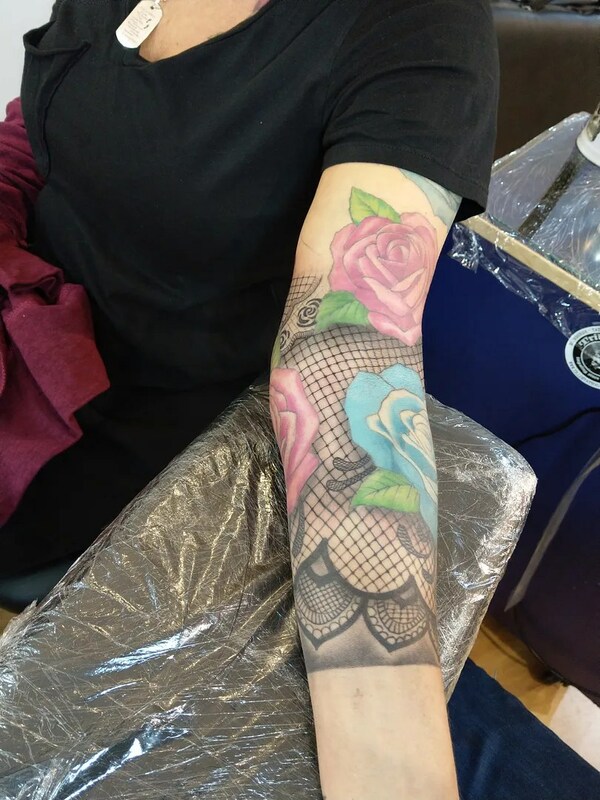 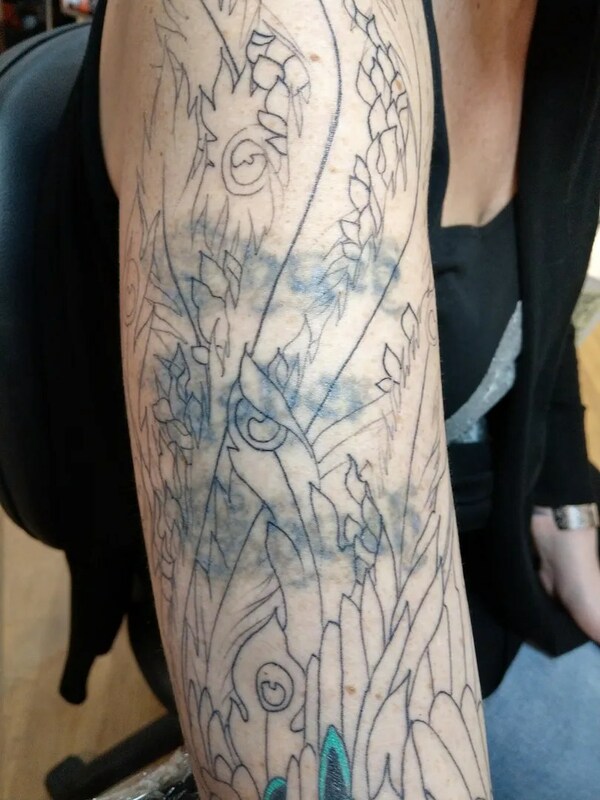 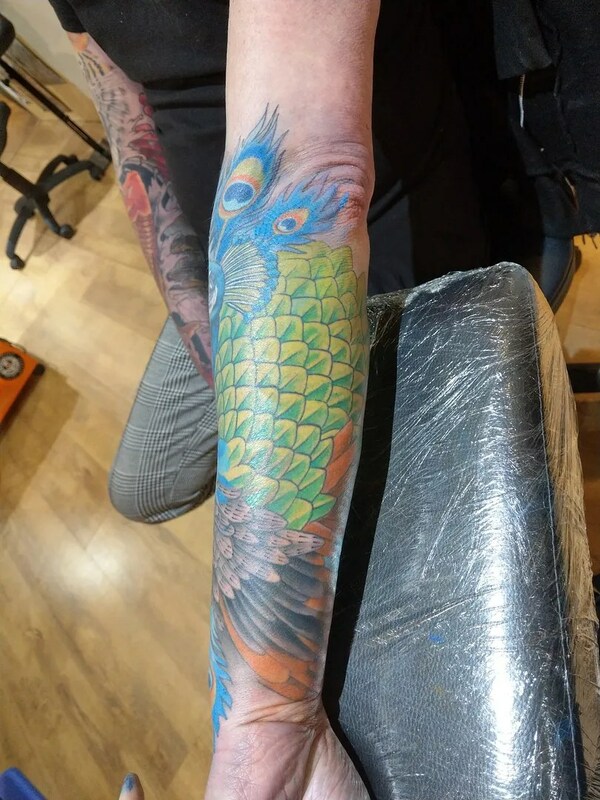 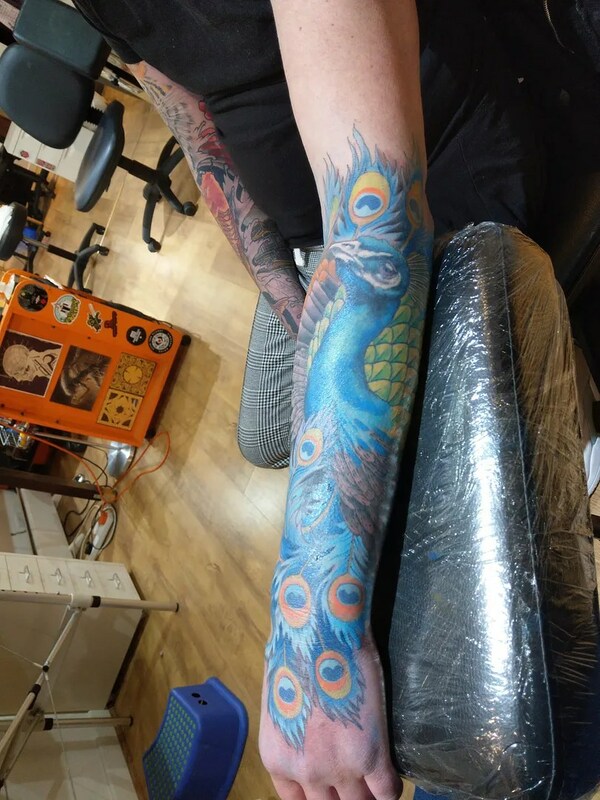 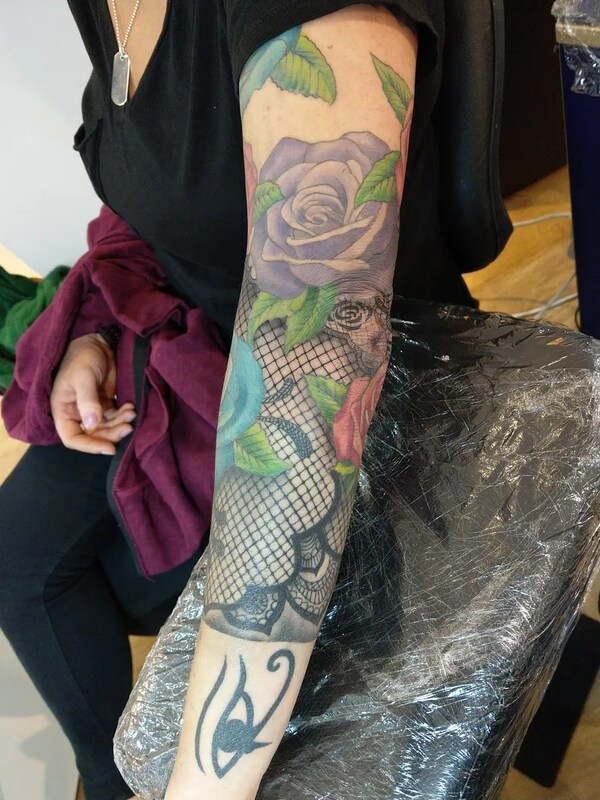 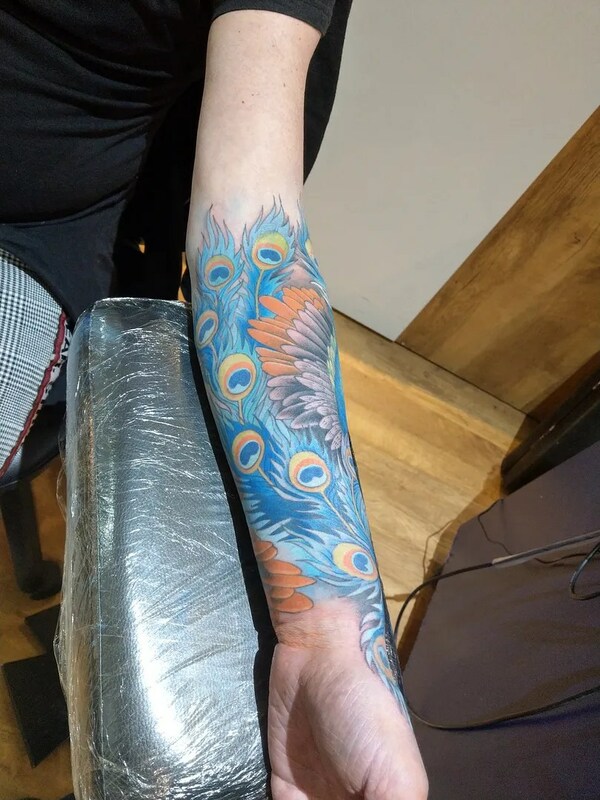 It’s also a cover up, Laura one of our laser techs, had zapped the old piece a few times so that it was light enough to be covered with colour.